The Whole Pig (May 2019) with Matthew Evans and James Mele: A two day hands on pork workshop. Our chacuterie class is sold out. Please email Zara@fatpig.farm if you’d like to go on the waiting list or if you’d like to be the first to know when we put up new classes. The transformation of pork is miraculous. Sweet fresh leg meat can become fragrant prosciutto given salt and time. Minced shoulder cures into mouthwatering salami. Middles can become luscious smoky bacon, delicately spiced pancetta, or complex tasting lonzo. For this two day workshop, we’ll be enlisting the help of bespoke butcher James Mele from Victoria’s Meat Room. James, whose Italian descent informs his love of the pig, is an artisan salami maker and experienced teacher whose passion for what is possible from a pig is absolutely infectious. Together with James and Matthew Evans from Fat Pig Farm, you’ll learn the basics of pork butchery, as we turn a whole pig into a range of smallgoods. It’s very much a hands on class, where you’ll learn the art of pumping sausages, curing meats, and much much more. The class is fully catered, and will end with a long lunch where we celebrate the pig in all its forms, along with a feast of plenty from the garden and matched with our favourite Tassie drinks. We’ll even send you away at the end with a few things to enjoy at home. Out of stock! The Whole Pig $650.00 The transformation of pork is miraculous. Sweet fresh leg meat can become fragrant prosciutto given salt and time. Minced shoulder cures into mouthwatering salami. Middles can become luscious smoky bacon, delicately spiced pancetta, or complex tasting lonzo. 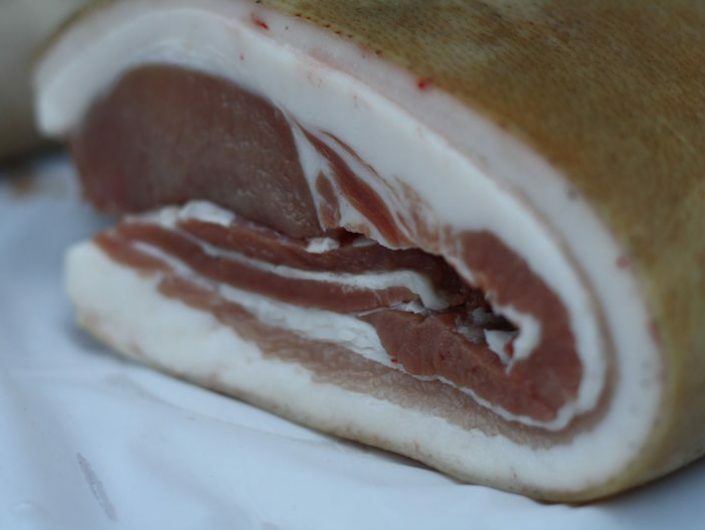 Join us on a two day workshop exploring the art and alchemy of pork butchery.